Complete freedom of choice of the best time to trade. You can trade at any time of the day or night, dedicating any amount of time you like: from 10 minutes a day up to 24 hours! Once again, the choice is completely yours! No currency pairs restrictions. If you have an adequate knowledge of EURUSD, then you can trade freely. If you got a good feel for other pairs – no problem, go ahead and trade on those. Life is never the same. It always goes forward. But, there is something constant in our world - it is our human nature. Like hundreds years ago we still want to be loved and respected, we are looking for understanding, success and wealth. Quick profit with small initial deposit. You can choose your trading time yourself. Only basic knowledge of fundamental and technical analysis is required. Constant feeling of real time trading. Bright emotions and adrenalin with no risk to your health. New Ultra_flatter indicator has been added into the system to filter the sideways movement or “flat”. New updated algorithm of Ultra_filter to make it more precise and accurate. The specific conditions for orders opening and closing are revised and improved. Practically any trader, particularly in the beginning of their career, tried scalping. You have to agree, that the sensations from playing Cat and Mouse give you an incredible “high”. Very few traders sustain the crazy rhythm of this type of trade.Only very few can stay with scalping for long. One of our developers in the beginning of his career got excessively involved in scalping and eventually got burned pretty bad. He was forced to sell his new Toyota Prius, his father gave him on his University graduation. However, what’s most incredible, is that the majority of people, who sustained losses in scalping, nevertheless, would like to try it again. As a general rule, these people are afraid of losses, pressure and nerve-wrecking experiences. They are also afraid to be unhappy with themselves if they, once again, sustain losses. However, now all these fears could be a thing of the past. You can, once again, safely open M1 chart. 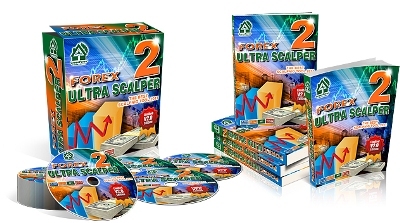 Now, at your disposal, there’s Forex Ultra Scalper – the unique software, that, just like an old friend, will guide you, give you clues and prevent you from making wrong moves. Don’t you agree, it’s always a pleasure to see the fruits of your labor not in a month and not even in a few days, but right away. Scalping, utilizing a new Forex Ultra Scalper, made once a fantasy a today’s reality. You can trade at any time of the day or night on any currency pair and enjoy a non-stop observation of your profit growth. Forex Ultra Scalper – any trader’s dream. Why scalping is so profitable? Your day starts and ends practically with the same level. If a trader opened his order in the beginning of the day and closed it at the end of the day, he made almost no money. However, the fluctuations throughout the day are quite substantial. Naturally, this is a diagram of an ideal trading. However, it gives you an idea that a scalper can earn a lot, whereas a regular trader can make almost nothing. You can try it on your own - to define the direction and the best possible moment for opening orders, however, it’s much easier to do it with Forex Ultra Scalper. Why scalping is so complicated? Often, it’s hard to find a correct direction as well as exact time for opening and closing of orders with a medium and long-term trading. However, a trader usually has time for technological and fundamental analysis. He usually doesn’t experience pressure or emotional strain. He rationally thinks, estimates and eventually makes a decision. With scalping, on the other hand, the trader’s mental pressure is increased many-fold. Often, he doesn’t even have a spare second to analyze situation and must make a decision instantaneously – and that’s not a one-time occurrence: he has to do it dozens of times a day. And if a trader starts making mistakes, this kind of mental pressure increases exponentially and could lead to an exhaustion and even depression and, as a result, to financial losses. 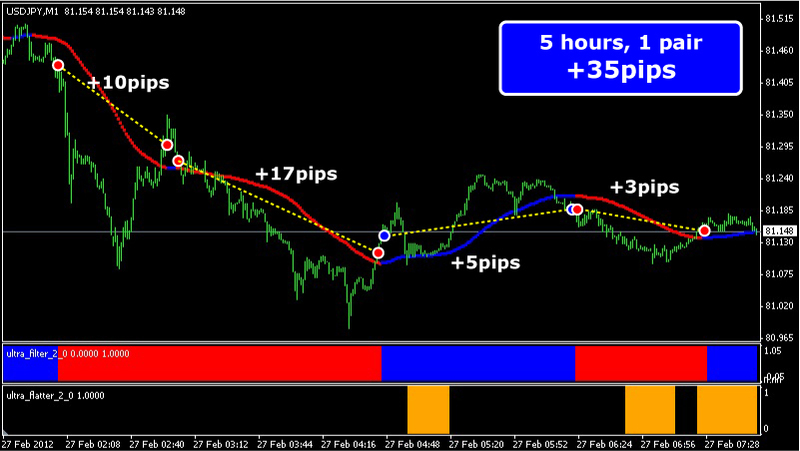 How to make scalping simple and even more profitable? If a trader is disciplined and has a sense of purpose and if he’s armed with a highly effective software tool, it is much easier for him to make decisions, making his life uncomplicated. Just imagine yourself crossing the street with a street light turned off. And now imagine that they turned it on. How much easier did it get to make decisions with a working light? And this is pretty much just how it is to make decisions with Forex Ultra Scalper. Scalping is highly delicate trading, that almost can’t be formally characterized. In scalping, a lot depends on trader’s intuition, his ‘feel’ for the market. So, in order to develop your own intuition and ‘feel’ the pulse of a trade, do NOT start trading simultaneously on 10 pairs. Start with one. Currency pairs vary. Each one has its own specificity, character, uniqueness and even its own “behavioral pattern”. Just don’t be lazy – observe, analyze and make your own conclusions and lastly try. There are different types of products on the market. But is there anything special about our Ultra Forex Scalper? YES! It is the INNOVATIVE manual system for scalping developed with our patented “Ultra Smart Prediction Technology”. It is UNIQUE system based on an IDEAL COMBINATION “Signal Generator + False Signals Filters”. It is not something new that has no reviews yet, it is the TIME PROVED SYSTEM that has been used by many customers and received many positive comments. 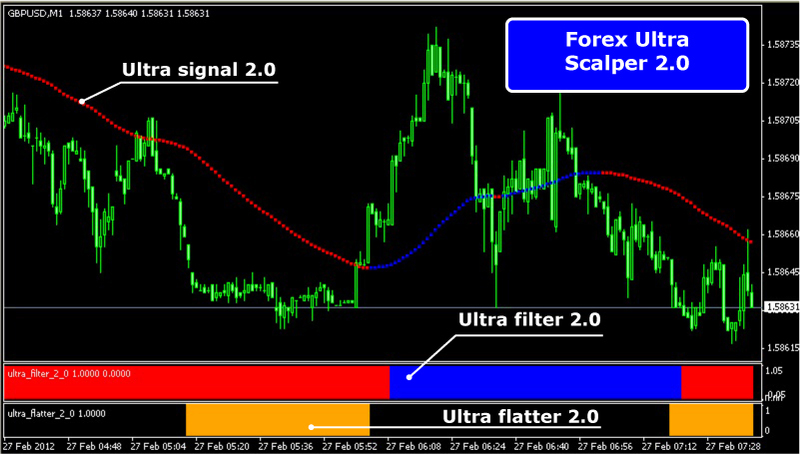 Forex Ultra Scalper begins to operate at the moment you loaded it into a chart. It analyzes previous price activity and “predicts” possible scenarios of further development. Minute by minute, new computations are being made. The more you trade with it, the more precise these calculations are. Any signals that are determined by the Ultra Scalper are not just passed to you, they are carefully filtered to make trading more reliable. All these computations are done “on the fly”, in a split second, sending the resulting signals to a trader. Though, please note that there are NO arrows, alerts or sound alarms, you need to analyze the real time data on the screen. Yes, you need to watch the graphics, but believe me Ultra Scalper does a lot more! It is EXTRA powerful tool for manual scalping (NOT A ROBOT). Once you try it, you will stop searching for any other systems. In any case, regardless of whether you are an experienced trader, who understands everything that’s written above, or a newbie, you need to know just one thing: Forex Ultra Scalper 2.0 performs flawlessly. From now on, you’ll be getting only good signals. Besides, Forex Ultra Scalper 2.0 for the first time implements the original “No-Boredom – Just fun” algorithm. We absolutely assure you that with our system there won’t be any dull moments! The product has one of the Up-to-date modern algorithms, designed around our “Ultra Smart Prediction Technology”. 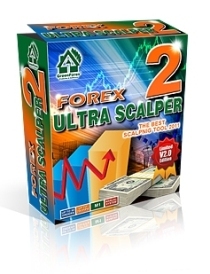 How much one can earn with Forex Ultra Scalper? 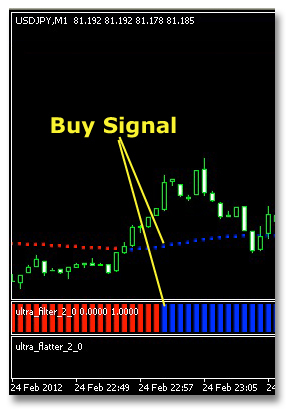 Our Forex Ultra Scalper sends out anywhere from 10 to 50 signals a day. Under different conditions, approximately 70-90% of the signals are quite profitable. If you trade 24 hours a day, without any coffee breaks or sleep, you could earn up to 200 profitable pips daily. However, this type of trading is quite tiresome. We don’t recommend that you take high risks and increase the lot size. Instead, use correct money management policy and you’ll be able to earn a stable income for a long, long time. Have you tried scalping, lost deposit and gave a word NEVER to risk again? Have you read a lot of unflattering things about scalping and, as a result, are afraid to try? You don’t know what to start with? You don’t like to open orders sight unseen, without actually seeing the market signals? Feeling bored at Forex and not happy as used to be? You continuously require a “shot” of adrenaline to keep you on your toes, wanting to open 10-50 orders a day? 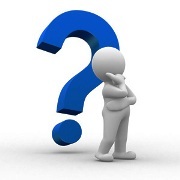 If you answered “yes” to any of these questions, then our Forex Ultra Scalper is for you! How to trade using Forex Ultra Scalper? and ... do NOT start trading!!! We ask you that you please read our User’s Guide. There you’ll find in great details all actions required to use Forex Ultra Scalper properly. It answers pretty much ANY and ALL questions you may have. Simply, read very attentively the entire Guide – it’s very short! …AND now, having fully understood when you need to open and close orders, you can proceed to trade on Demo Account. Make sure you first try to trade using a Demo Account. It will allow you to see and evaluate the signals, to open and close orders correctly, while preparing you to trade on a real account. You WILL see that trading with Forex Ultra Scalper is EXTREMELY easy! 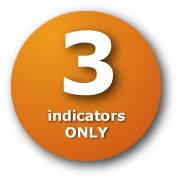 Forex Ultra Scalper 2.0 has “only” 3 indicators. Moreover, our programming team is slaving away, trying to squeeze the entire powerhouse of this system into a single indicator. You think it’s not enough? Scalping is a trade that requires instantaneous decision-making. Agreed, in a situation like that, you absolutely don’t have time for comparative graphic analysis of 5-10 indicators. And that is exactly why we strive to minimize the graphic reflection of the signals, meaning we try to make the visualization as much user-friendly as possible and simple. At the same time we managed to implement innovative filters to block almost all false signals. Our goal was to make a system that would be super powerful on the inside and quite neat on the outside. And once again, we did just that! By installing Forex Ultra Scalper in your chart, you install a SUPER powerful, highly reliable system with the elements of A.I. Artificial Intellect. The system, built, so that each and every trader could fully enjoy the active scalping, while receiving accurate and timely signals. Widening the spread. Spread is the money that broker makes from each of your orders. The size of the spread isn’t constant and can be changed by a broker at his/her discretion. Make sure (!) to inquire about the size of your broker’s spread and choose the one with preferably minimal spread. Cheating. This is a very common occurrence, belonging to Expert Advisors. When you robot begins to make profits in rather large chunks, the broker can start implementing “cheating”. The simple example is the unexpected, sudden (1-5 sec.) 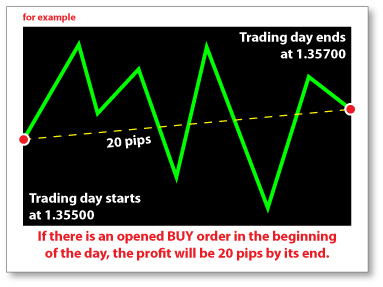 price movement, which closes your order on Stop Loss. If you check the quotations on another broker terminals, you may not see such activity there. So, now that it’s “cheating”. During the war, “weapon” developers search for any available means to have a trader win each and every battle. So, if it’s impossible to fight the Spread Augmentation or Requotes, counteracting and fighting the Cheating must be mandatory. And because each trader is unique, a broker is helpless to do anything. Choose only a broker with a good reputation. Many forums have entire sections exclusively dedicated to brokers. There you can learn about all the ‘pluses’ and ‘minuses’ of each broker. Don’t be lazy – take a look and see it for yourself. Choose a broker with a minimal spread. An excessive spread may make your scalping gainless. A large spread is, simply, a chunk out of your pie that goes to somebody else. We don’t advise you doing scalping from ECN-broker terminal. ECN brokers take disproportionately large commission from each order and this commission is much larger than any spread by non-ECN brokers. The theme of “delays” is raised quite often at both, the forums and in the correspondence we receive from our members. Indicators send delayed signals and don’t allow earning all possible profits. We agree, oftentimes indicators send signals a bit later. However, try to choose which is better of the two: the early and incorrect signal or a late, but extremely accurate one? We think the choice is obvious. Possibly, the only preemptive signal could be divergence/convergence and exactly this algorithm that we use in our Forex Ultra Scalper. Should you wish to learn more about divergence/convergence, there’s plenty of information about it on the internet. Forex Ultra Scalper is universal. You can use any pairs for your trade. Just calculate your strength accordingly. Don’t start trading on 5-10 pairs at once – you may find yourself very tired doing so. Besides, each pair has its own “character”. Having recognized it, you could achieve much higher results. To learn the “character” is quite simple: you just need to do some observation while trading with Forex Ultra Scalper. Adrenalin. 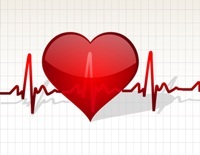 Your heart beats faster, your senses intensify, your pupils dilate. Your blood rushes through your veins even faster, your muscles contract and get tense. Your mind plays a multitude of visuals. You start to resemble a loaded gun. If the adrenaline is accompanied by a profit – yes, that is good! Some traders, while trading on forex, become adrenaline-dependent. These people resemble drug addicts – time after time they open M1 and it is losses, losses and even more losses… No one wants THIS type of adrenaline. We, on the other hand, want to offer you to experience an adrenaline of a different kind. Trading with a Forex Ultra Scalper will give you a simultaneous sensation of adrenaline rush from scalping and a sudden burst of pleasurable sensation from turning a profit. At the end of the day, in spite of your tiredness, you’ll be able to proudly glance in the Account History and then your feeling of being tired will suddenly disappear, leaving only the hormones of “happiness” – the endorphins circulating throughout your body. You’ll only have two “enemies”: Saturday and Sunday. Only during those two days Forex is silent. But try to use even these two “enemies” to your advantage. You’ve got two whole days to analyze your trade, draw your own conclusions, so that the following week you can earn even more. The Forex Ultra Scalper will always be with you. When will this system pay for itself? It will all depend on the size of your deposit and the risking practices of your trading style. Even with the smallest lot (and the deposit of around $100), exercising a minimal risk, the system will pay for itself in 3-5 days. If your deposit is greater, the system will pay off even sooner. The only one thing that we’d like to ask you for, is your honesty. If the system already paid for itself, please don’t abuse our refund policy. Be honest. We’ve managed to flawlessly accomplish our task, so that you could rip the benefits of our labor. And for those, who after having received a refund still continue using our system, we’ve developed an algorithm, that turns off the program’s indicators at the end of the 30-day term after the purchase. Any currency pair at your disposal. You can use either your favorite EURUSD or any other one you fancy. At long last you can derive enjoyment from scalping, while turning profit at the same time. To start using Forex Ultra Scalping you won’t need any special knowledge. Simply having enough time, ability to concentrate and the Forex Ultra Scalper, you can make money every minute of every day. 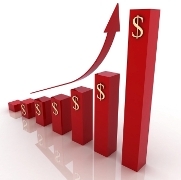 Turning profit from even marginal price fluctuations any time of the day of any workday. Is it possible to increase your profit even more? The principle of trading with Ultra Scalper is to place the orders manually following the special conditions described in the system. If you don’t want to lose your profit at the price reversals, we can recommend that you use Trailing Stop in your trade. For each new order you can establish its very own Trailing Stop level. However, if you have already studied the behavior of certain currency pairs and with a certain currency pair you always use the same Trailing Stop value, we highly recommend that you acquire Forex Trailingator. It is the HANDS-FREE Stop Loss tool for any pairs and any timeframe. Not a robot, not an indicator. 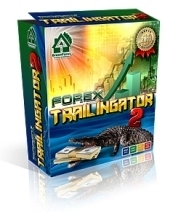 Forex Trailingator is an intelligent Trailing Stop, responding (reacting) to each and every order opened by you… On its own, it will set a Trailing Stop and will keep a close watch on your order. You won’t even need to set the Trailing Stop separately for each open order. The resulting saved time could be used to track down the signals on other currency pairs. Additional information could be found in the User’s Guide, as well as receiving a special 50% discount coupon with a purchase of the Forex Trailingator. You’ll be pleasantly surprised that all your questions will be answered virtually immediately. Try to submit a question and you’ll come to realize that we are THE fastest and most responsive team out there. Agree - it’s imperative when your money’s at stake. That means that should you have any questions, no matter how trivial, we’ll answer any in a rapid-response manner. than any other out there. Take our word for it – you’ll be pleasantly surprised! 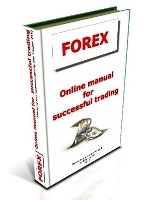 SUPERBONUS: "On-line manual for successful trading". it is the MANUAL system for scalping. This is the First if its kind offer, but please keep in mind that nothing can last for ever - this is the limited time offer that is available to you for few more days only. Q: I’m a newbie. How difficult will it be for me to master scalping following your system? A: If you know how to open an order and you have a color monitor – that’s sufficient. 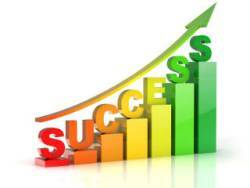 You already can work with our system and make money. Should you have any additional questions, please contact our 24/7 Customer Support. Q: If I trade on a few pairs simultaneously, how high is the risk to miss the signals? A: Please don’t rush into trading simultaneously on multiple pairs. Yes, you may even trade on all pairs at the same time, but it won’t make more sense. Instead, we recommend that you limit yourself to 1-2 pairs , study them, observe their signals and only after successful trading on 1-2 pairs, should you move on to increased lot size. By doing so, it won’t make you spread your attention all over and simultaneously increase the size of your profit. 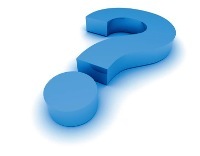 Q: You mention, that the said system can be utilized to trade at any time of the day. 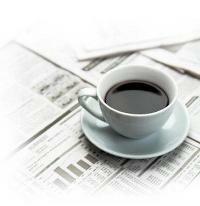 Nevertheless, the market activity considerably varies during the day. According to your test results, what time of the day is the best time for turning the highest profit? A: With Forex Ultra Scalper, there’s no limitation on the time of the trade. The market is in constant motion. So, even with the insignificant price fluctuations, you can still make money. Q: I read that if I ask for a refund, my program will stop working after 30 days from the date of purchase? However, if I happened to like the program, do I need to renew/extend my license or you will do it automatically? A: After 30 days if you don’t request a refund and if you are happy with the program, please e-mail our support team and indicate the name of your product, order number and the date of purchase. We will renew your license free of charge. Q: I’ve got a computer at work and a home notebook and I usually trade from both places. Do you limit the use of the program to only one (1) computer? A: Yes, we expressly ask that our customers don’t use our program on more than one (1) computer at a time. 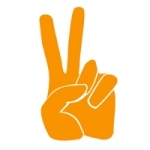 Besides, the system can be installed only on 1 real account, with a maximum number of Demo accounts set at 5. All our products are traceable through the internet, so please don’t violate this ‘intellectual property’ policy. Q: If I happened to like your product, can I buy additionally one more version of the program to trade from another computer? A: Yes, of course. Please contact our friendly Customer Support team to get an additional license, that you’ll be able to get at a 50% discount. Q: You have a few manual systems. The last Forex Octopus already earned me almost $16,000. I’ve decided to quit my day job and concentrate exclusively on Forex. I’ve got 5 pairs I trade with and I know their “qualities and peculiarities”. In your opinion, should I begin to simultaneously trade using all 5 pairs? A: Honestly, we’d advise you not to be “greedy”. You’ve got plenty of time for experimentation. Start small: 1-2 pairs and if you begin to feel that you can increase the number of pairs, only then you can safely do so. Q: In the event that I don’t like your product, do you guarantee me a full refund? A: Yes, absolutely! We keep our promises. All our customers, who ever requested a refund, got it. Q: I’ve got an unstable internet connection. Will it affect the precision of the signals? A: We don’t advise people to do scalping, if you don’t have a reliable internet connection. It’s quite possible that your order may be open, then you lose the connection, as the price will reverse. This way, theoretically, you could sustain some serous monetary losses. Q: I didn’t buy your Trailingator along with Forex Octopus. Can I buy it now at a discount rate, if I buy Forex Ultra Scalper? A: Yes, of course! We highly recommend Trailingator to go along with our manual systems. 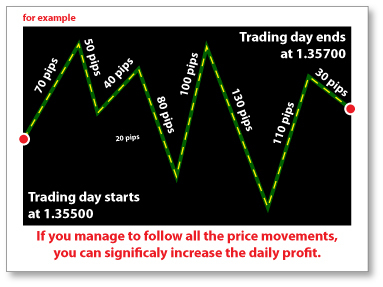 It is simple in installation and helps you to secure your profit when the price reverses. However, when using Trailingator you’ll need to select a small Trailing Stop value, since the trades will be shorter than in the case with Forex Octopus. Q: How often does your system send out signals? How many hours a day should I spend in front of my monitor? 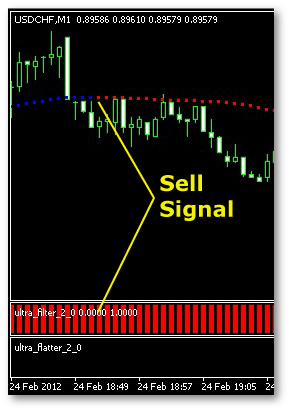 A: Forex Ultra Scalper sends out somewhere between 10 and 50 signals daily. You can plan out your own time as you wish. You may spend in front of the monitor either 1 hour or 12 hours – it all depends on how much you want to earn. One of our testers actually spent in front of his monitor 53 hours with a couple of breaks for coffee and short catnaps. He increased his deposit of $500.00 by 2.5 times. However, we think that this type of trading is a bit extreme, so we don’t really advise to exhaust yourself to such a degree, as it leads to a loss of concentration and, as a result, to possible monetary losses. Q: Does your system give Stop Loss and Take Profit levels? A: The system sends out signals to open and close orders. You can also use Stop Loss, of which you can read up in the User’s Manual. Besides that, you can use our Trailingator to maximize your profit and automate your trades. Q: Do your indicators change color? A: Our Indicators don't repaint if you mean it, but they do change colors as a signal for you to open/close an order. Q: Will this product equally have an expiration date just like all your other products? A: Yes, it will! As soon as our product notifies you of its expiration, please shoot an e-mail to our support team and we will, without further delay, send you an unlimited version of the program. This is our way to protect our interests against dishonest users of our software, who use our 100% 30-Day Money Back Guarantee to get a refund and who still continue using our products afterwards. Q: What brokers does your system work with best? A: This page has detailed recommendations on how to choose a broker for scalping with our system. Believe us when we tell you that having a reliable broker is one of the most important conditions for successful scalping. Unreliable broker, on the other hand, can annihilate all your efforts: you either won’t make any money or worse, will sustain monetary losses. Q: I’ve got a small deposit of around $130.00. Can I trade using your system? A: You have a real chance to radically increase the size of your deposit. You risk very little when you use our system. If you pay a close attention to what’s going on and can concentrate on your trades, your deposit will grow steadily. Q: I read in one of the forums some quite unpleasant things about scalping. One of the traders was writing that in 2 months of trading he almost got divorced, became a nervous wreck and on top of that lost $800.00. Now, I’m afraid to use scalping. What can you advise me and how can you reassure me? A: Internet is full of various opinions, comments and reviews. There you can read about all kinds of encounters – from success stories to total collapses and breakdowns. Everybody can find a ‘story’ that will resonate exclusively with him/her. We wouldn’t want to reassure you of anything. The only thing that we stand behind and can guarantee is that the scalping utilizing Forex Ultra Scalping is both, a pleasurable as well as profitable activity. However, like with everything else, the final decision is ultimately yours. Just remember: you can always get your money back with our 30-Day no questions asked, 100% money back, guarantee. We believe that this alone should make your choice a much easier one. We absolutely guarantee your satisfaction! REMEMBER: We thought you might like to know and it would be worth noting that part of the proceeds is transferred to the Environmental Protection Fund. Acquiring any of our great products, you’re not only getting a top-notch financial instrument, but at the same time help ecologically protect our beautiful blue planet.